Market conditions and performance for the week ending February 8, 2019. The market was flat this week and Goldman Sachs says the market has *probably* already gone up as much as it will all year. So, what should you invest in now? Some suggestions from experts are towards the end of this post. By the way, have you heard about our Valentine’s Day promo? Give an investment for Valentine’s Day. Give $25, Get $5 in the same investment as our Valentine’s gift to you. Learn more about buying “Stocks for your Sweetheart” here. EA is up about +20% year-to-date already. This week’s rise came in just one day, today February 8th, when the stock rose +12.9% immediately after the company announced strong engagement for the recently released Apex Legends. By the end of today it was up +16% for the day. The company’s stock was actually down for the week as of just yesterday. A lot of AMD’s decline took place on February 5th, presumably after news came out that a large investor, the Abu Dhabi state fund reported it was selling a large portion of its investment in the company. The stock dropped -3.40% on the 5th. The market (the S&P 500 SPY ETF) has risen +7.88% year-to-date and +15.05% since its low on Christmas Eve. 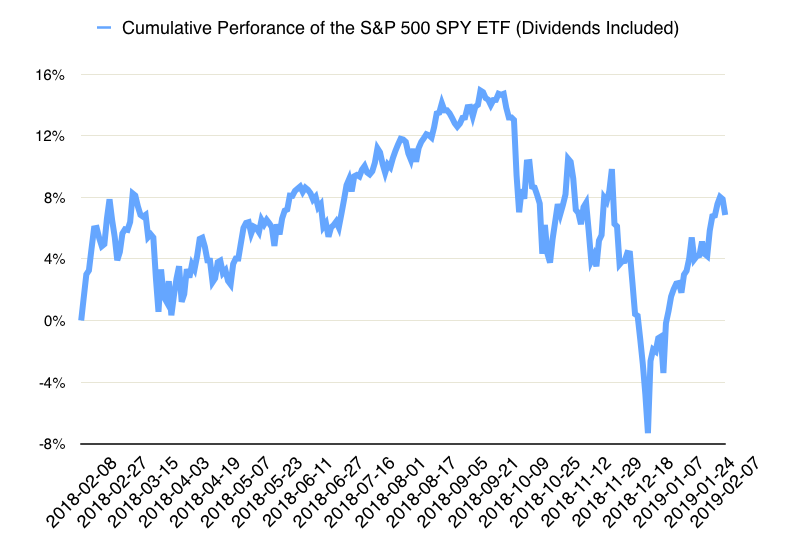 It has almost recovered a good portion of last year’s fourth quarter losses, but not all of them, as you can see in the graph below, which shows the last year’s cumulative performance of the S&P 500 ETF. The high came in early September, and it hasn’t yet returned to that level. However it has climbed a lot since just December 24th. There aren’t too many calendar years in history when the S&P 500 has returned more than 15%. Market strategists at Goldman Sachs are predicting that the market has already experienced most of its returns for the 2019 calendar year. This week, the S&P 500 SPY ETF was almost totally flat, returning just +0.18%. The Dow Jones Industrial Average and NASDAQ Composite also rose ever-so-slightly: +0.17% & +0.47%, respectively. Meanwhile, bonds (BND ETF) performed slightly better, +0.31%, but gold (GLD ETF) dropped a bit, -0.24%. Now, what should you invest in if you think Goldman Sachs is right that the market will not go higher than it already has in 2019? Investments for a down or risky market. Two of the largest “safety” investments in the portfolio recommended for uncertain times by the top hedge fund manager of all time, Ray Dalio, are U.S. government bonds and gold. You can invest in Gold on our platform. We will be adding U.S. Government bonds next week. Gold is considered a risk-off investment. 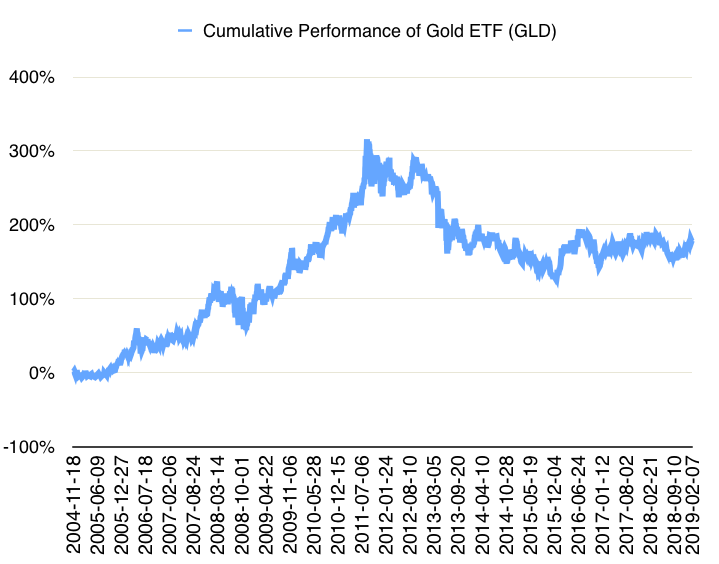 The graph below shows how in 2008, when much of the market experienced the financial crisis and dropped significantly for the year, the GLD ETF, which effectively buys the gold for people who invest in it, did not. It was up about +5% for the year of 2008. 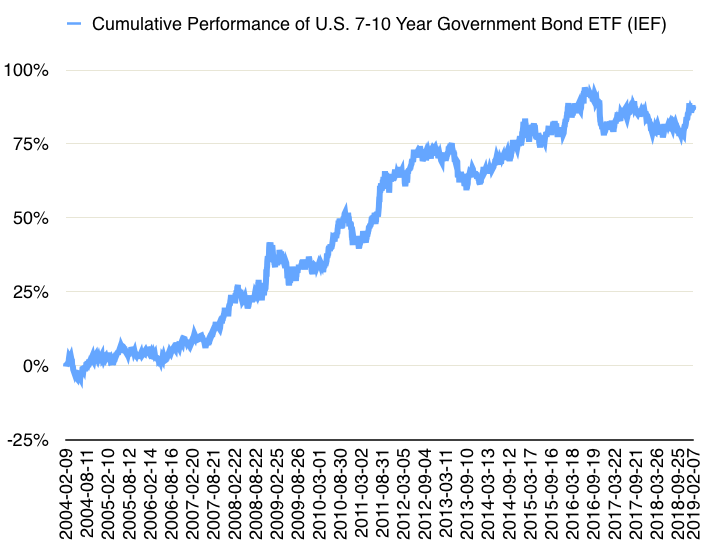 U.S. Government Bonds, which you can invest in easily through an ETF, which essentially buys the bonds for the people who invest in it, are also considered a reliable investment during a risk-off environment, when investors flock to safety. The U.S. government has one of the highest ratings in the world, which means that it is essentially unimaginable that it would ever default on its debt and not be able to pay it back. Below you can see its performance during the financial crisis as well. In the year 2008, the IEF ETF of U.S. Bonds returned about +17%. Important Note: The above performance is as of February 8, 2018. Past performance does not indicate future performance. The information included in this publication is for educational purposes only. iBillionaire gathers its data from sources it considers reliable. However, iBillionaire does not guarantee the accuracy or completeness of the information provided in this publication. The opinions presented reflect the current judgment of the authors and are subject to change. iBillionaire makes no warranties, express or implied, regarding the accuracy of this information or the subjective opinions expressed by the authors. Officers, directors, employees and affiliates may have positions in the securities of companies discussed. The data included in this publication cannot and is not intended to, in and of itself, be used to determine which securities to buy or sell, or when to buy or sell any security or investment, or represent directly or indirectly, that any graph, chart, formula or other device being offered will assist any person in making his own decisions as to which securities to buy, sell, or when to buy or sell them. All investors should consider the limitations of the information provided and the difficulties with respect to its application to any investing activity.